Simply Shanty, formerly known as Memory Boards & More, was established in 2016. It was inspired by a passion for art and creativity. We create wood and fabric picture boards, frames, home decor, and so much more! You can find us on Facebook and Instagram. Squirrel Hill Design and Craft creates highly accurate one of a kind topographic maps out of thin sheets of cherry and maple wood. Lotion bars are a mess-free way to moisturize you and your family’s skin. Infused with botanicals, and plant-based butters; your skin will thank you. These make wonderful gifts for absolutely anyone! A zippered pouch to print on! Join MMMily Handmade for a summer pop up shop! A tote bag to print on! Join MMMily Handmade for a fall pop up shop! In this class we will learn how to make exposed spine journals using the French link stitch. And 5 greeting cards to print on! Learn the basics of screen printing with Kitty Box Press! Practice a few fluid painting techniques and make a statement piece to decorate your home! Ever wanted to learn to crochet? Join our beginners class! Join MMMily Handmade for a spring pop up shop! Cables are one of the most intriguing knitted textures and the great news is, they're not that hard to make even for a beginner. MinaMakesInk specializes in celestial prints, sassy patches, and screen printed items. Always wanted to get the needles clicking? This class is for you! Laughing Gull Chocolates uses ethically sourced chocolate and local ingredients to create delicious truffles and treats right here in Rochester. Meet John Ballou of Jack Bear Stamps, our February 2019 Featured Artist, at his pop up shop! Learn the art of needle felting and make an adorable polar bear! Join us at Little Button to see Diane’s fascinating antique button work and frozen time pieces in person! Join Scarlett Markham of Flour Pail Kids as she displays her upcycled Skateboard pins, embroidered patches, and other Rochester inspired crafts. Stock up on deliciously scented candles with Love Light Etc at their pop up shop! Keep your family looking rad with MAD Coast clothing! Get your goodies and keep warm this winter with handmade knitwear by the Loch Knit Monster! Rachel Weber Designs is once again popping up at Little Button Craft! 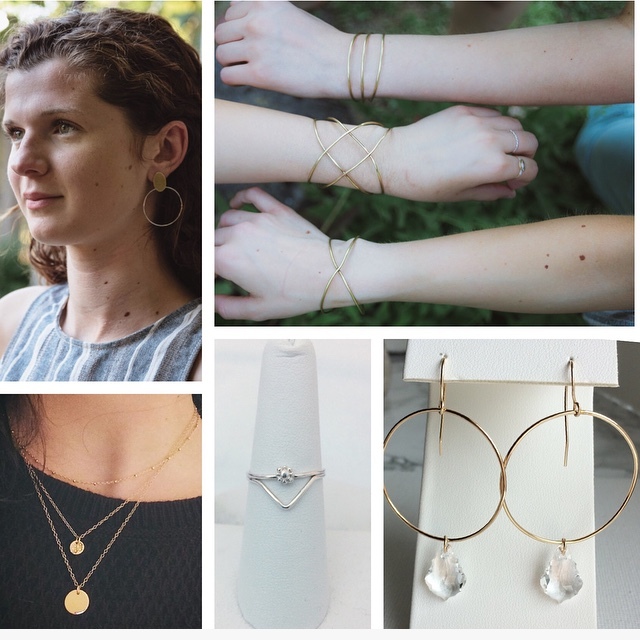 Come see her hand crafted minimalist jewelry on December 15 from 12-4! Each piece is delicate and classic.... perfect for an everyday look or special occasion! It is her final show of 2018, which means it's your last chance to get that special someone (or yourself) this timeless jewelry in time for the holidays! You don’t wanna miss this art garage sale, Local art, priced to move! Come get some chocolate goodies for Christmas made by Laughing Gull Chocolates! Allison McCue creates art that makes you want to pause and take a closer look. 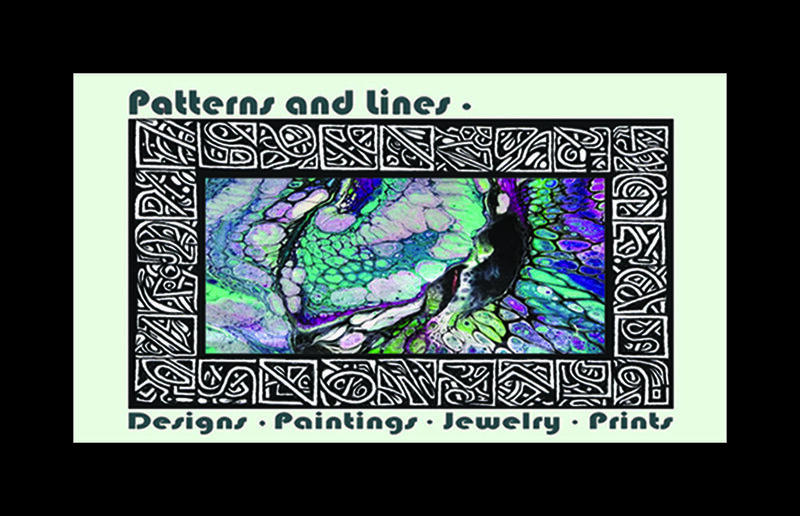 With paint, pens, and markers, she makes geometric shapes with contrasting colors peppered with unexpected detail. With intricate symmetrical designs and intriguing swirls of color she invites you to briefly lose yourself in the complexity and balance of "Patterns and Lines". Join us on Small Business Saturday at Little Button for a unique pop-up event! Mmmily Handmade is a collection of hand crafted bags, accessories, and home goods using a variety of unique, modern, and hand-printed fabrics. Owl Post Lettering is having a Black Friday Sale, you don’t wanna miss it! Samantha Lynn has been studying herbalism for the last three years and crafting for two! She is the creator of Wholistic Herbals, a business that crafts products people use in their day to day lives and uses whole and locally sourced ingredients whenever possible. Join Nancy Topolski for a needle felting workshop and make your very own elephant! Tap or Click on a particular date to see a preview of the event that's occurring on that date. Tap or click a second time to see more information or sign up for a ticket to the event.